ARLINGTON, Texas (AP) - Mother Nature messed with Texas - and might not be finished. The questions now: Did the cold, icy blast ruin everything for the first Super Bowl week in Dallas-Fort Worth? Or can the region save face in the final hours before Sunday's big game between the Packers and the Steelers? This was a long week even before snow and ice fell off the roof of the $1.3 billion Cowboys Stadium in Arlington on Friday, injuring at least six people. Bad weather forced the cancellation of hundreds of flights, cutting short the time - and the money - fans would be spending in town. And just when things were looking up on a bright and sunny Saturday, snapping a 100-hour streak of subfreezing temperatures, snow was back in the forecast for Sunday. "It's a little depressing," said Marc Castaldo, a bar manager in downtown Fort Worth. "I mean, this is Texas." The cold week in Texas still amounted to an early spring break for the stalwart visitors from Pittsburgh and Green Bay. It wasn't so fun for everyone else as 500 schools and day care centers in and around Dallas-Fort Worth were shut down for days, leaving crabby parents stuck at home with bored kids and few options because of the icy roads and sidewalks. Downtown Fort Worth was a deserted sheet of ice early in the week before things thawed a bit Friday. By then, fans were tiptoeing around puddles of slush and walking on shoveled sidewalks - the kind of scene one might find at the Winter Olympics. "Would it have been nice to have 50 or 60 (degrees)? Sure," said Steelers fan Tom Detar, who drove in from suburban Pittsburgh early in the week even though he knew he would be going home before the game because tickets are too expensive. "But that's why we brought some warmer clothes." The region is taking a beating online from celebrities, players and reporters - not the type of reaction Cowboys owner Jerry Jones had in mind when his vast new showplace was picked to host the NFL's signature event. Peter King of Sports Illustrated labeled the snowy, unplowed "moonscape" a "debacle" in a Twitter message even before Friday's ice accident at the stadium. 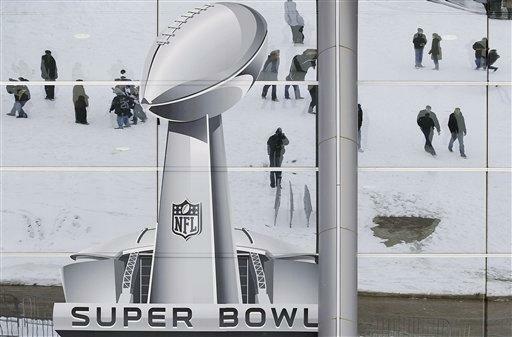 Agent Leigh Steinberg tweeted: "No one blames Dallas for snowfall, but who was cleaning roads of snow, light traffic downtown, no one outside, not typical atmosphere" for a Super Bowl. Philadelphia Eagles receiver DeSean Jackson wouldn't know - his flight was canceled. "Not headn to Dallas any more ... O well," he tweeted Friday. By Saturday, complaints of baggage nightmares had faded, most major roads were clear and dry and temperatures warmed into the 40s. Airline officials said operations were normal and they anticipated getting most Super Bowl travelers into town despite cancellations throughout the week. Still, the head of the Dallas Restaurant Association estimated that as many as 70,000 people might be trying to get to the area Saturday - which suggests quite a bit of revenue was lost this past week. "We've had an amazing amount of unfortunate situations because of all the prepaid rooms ... that were left vacant as well as parties that were planned and catering functions," executive director Ed Griffin said. It wasn't all bad, though. The favorable turn in weather meant that hotels were filling up Saturday and Sunday nights after seeing cancellations all week, peaking Friday when a morning snowstorm dumped 5 inches in the Dallas suburb. "We had cancellations Tuesday, Wednesday, Thursday, Friday just because that was when the weather was at its worst and people were panicking a little," said Charles Lufkin, manager of the Admiral Hotel, which is near Cowboys Stadium and fully booked for the weekend. "Considering everything, we're happy." Everyone will be happy if the snow finally stays away Sunday and the Steelers and Packers play a game for the ages in a stadium that has already hosted an NBA All-Star game and could break the Super Bowl attendance record of 103,985 set in 1980 at the Rose Bowl. The National Weather Service forecast rain Sunday, with a possible switch to snow around 5 p.m. - just in time for kickoff. Less than an inch of snow was expected, however. Former Arlington Mayor Richard Greene is among many crossing their fingers. "Looking out there today and seeing the beautiful sunshine and the sun melting away all of the ice and snow, I think that weather problems have already become part of the history and footnote," Greene said. Well, except for that nagging Sunday snow forecast.